It's been awhile since I've been down to the Scripps Pier. I know it's a hot spot for landscape photographers now because of Peter Lik. And it was, I had to wait in line to get this shot, but I needed to get done. I've been slowly working on shooting all the piers of Southern California. Only a few more to go. This pier is not quite like the other piers in that its symmetry is really nice. The columns stand straight up and down creating a really nice view into the horizon. 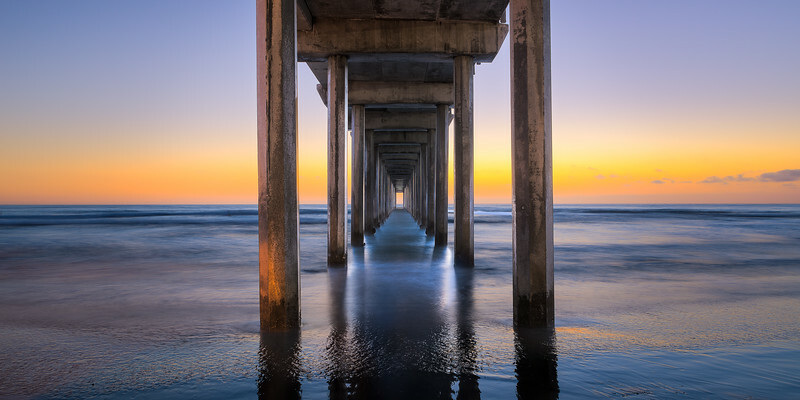 I think as a photographer if you're looking to shoot Scripps Pier, do it on a week day, and maybe in the winter. You might have less people to contend with.